The Ladykillers . . . 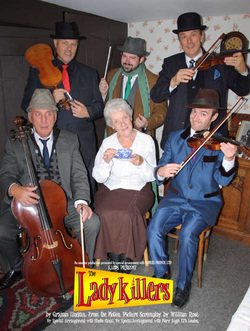 The Ladykillers tells the story of the eccentric little old lady Mrs Wilberforce who lives alone with her parrots in a strange lopsided house in King’s Cross. Her life is turned upside down by the arrival of Professor Marcus and his four friends, who between them make up the most unlikely group of criminals. Planning the heist of a security van, they decide to use Mrs Wilberforce as cover and involve her unwittingly in the plot. 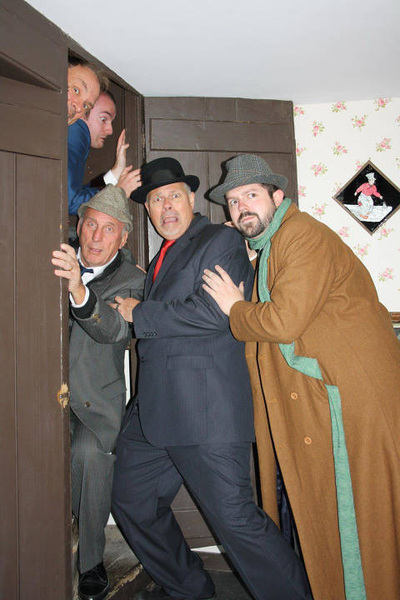 Things do not go well and the Professor’s plan starts to unravel in spectacular and hilarious fashion. John Giller played the role of 'Louis' in this very funny comedy by Graham Linehan. From the Motion Picture Screenplay by William Rose. Posing as amateur musicians, the villainous Prof. Marcus and his gang rent rooms in the house of sweet but strict Mrs. Wilberforce. Unwittingly using her in Marcus’ heist job, the police are left stumped as Mrs Wilberforce becomes wise to the ruse. Marcus concludes that there is only one way to keep the old lady quiet. But who will be forced to face the music? 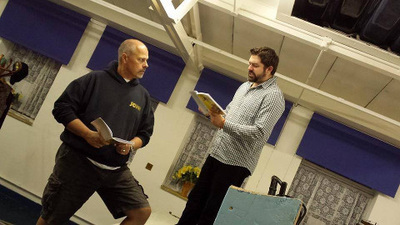 Classic Ealing comedy hilariously adapted for stage by the writer of Father Ted. _ Crime doesn’t pay –but it can be hilarious, is the message from the latest production of the King’s Lynn Operatic and Dramatic Society, The Ladykillers, which opened on last night (Thursday, October 30). A 2011 rewrite by Norfolk-based comedy writer Graham Linehan of the 1955 Ealing Film Studio classic with Alec Guinness, this tells a salutory tale of what occurs when five villains descend on a house in King’s Cross to plan and execute a daring robbery. The gang is led by Professor Marcus (Steve Bond), who fancies himself as the thinking man’s criminal. Indeed he passes himself and his henchmen off as a chamber orchestra (with the help of a closed door and a record) to keep up the pretence. The landlady is Louisa Wilberforce (Louise Smith) who seems the epitome of sweet little old lady. But we know that when it comes to ruthless desparados versus dotty granny, in farce there can only be one winner. 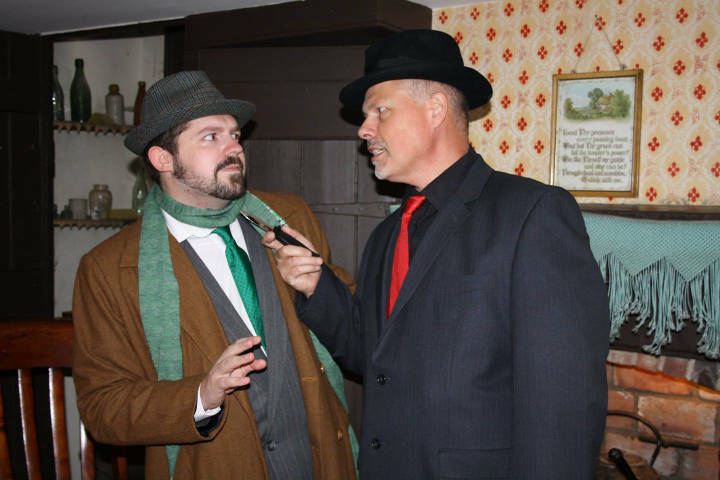 Marcus looking for the perfect ‘elegant’ ending to his heist incorporates an unknowing Mrs Wilberforce into the robbery to bring the loot home without the polcie suspecting. But helpful policemen and other old ladies demanding to be entertained by classical music lead the whole plot to unravel with murderous results. On the opening night, the pace, so vital for what is essentially a farce, maybe sagged a little at times, but the production was pushed along by the quality of the writing and the sheer excellence of the performances. 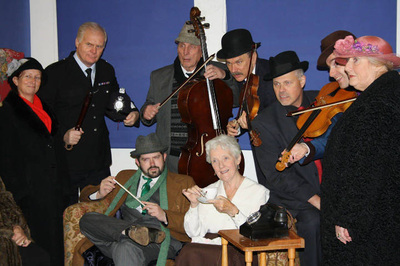 Louise Smith (doing a fine Joan Hickson impersonation) and Steve Bond made strong leads with David Coles (nervous wreck The Major), Anthony Drown (spiv Harry) and Tony Downing (cerebrally-challenged heavy ‘One-Round) are all wonderful. 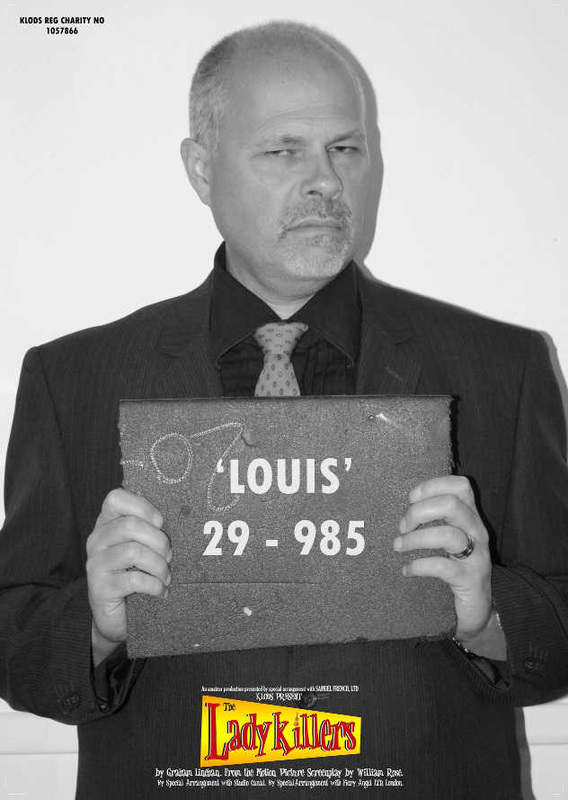 But the superb John Giller rather steals the show as Romanian thug Louis (Herbert Lom in the film). Also appearing are Rob Sweeny as Pc Macdonald and Sandra Cartwright as Mrs Tromleyton. Well done KLODS – another winner! 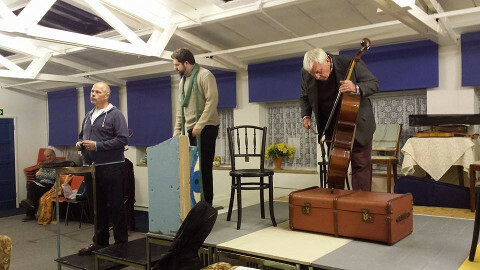 Recently, I have come to dread reviewing productions by The King’s Lynn Operatic and Dramatic Society. I love everyone at K.L.O.D.S and admire the society greatly and yet I have (on occasions) found myself leaving the theatre thinking, it was OK, but they could have been better. This generally results in a lukewarm review that continually disappoints committee, directors, cast and crew. I seem to have waited so long to write a radiant review of a production that I think is truly worthy of the great heritage of this society. This time round the offering was Graham Linehan’s reworking of the Ealing Comedy masterpiece The Ladykillers, and I was willing them on in a way I have never done before in the sincerest of hope that I could give them the review they would want. Well, to cut straight to the chase.….. Here comes the review I have always wanted to write. 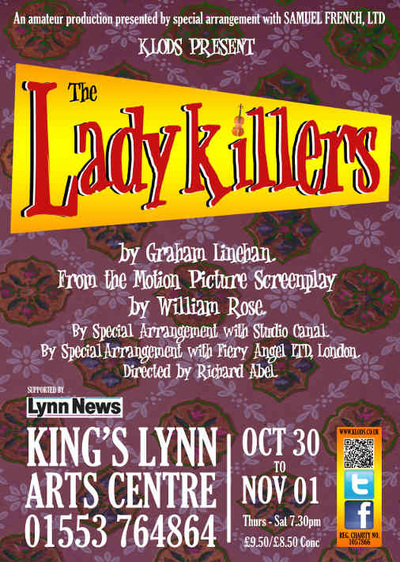 The K.L.O.D.S production of the Ladykillers was simply, breathtakingly brilliant! There I said it, now we can all relax. Beyond that overly dramatic headline statement, there is so much to tell, starting with the story, of course. A disparate group of thugs and criminals are assembled by criminal mastermind “Professor Marcus” to plan a big robbery and a room is rented in the house of widow Louisa Wilberforce’s house, close to the location of the robbery to plan the event. 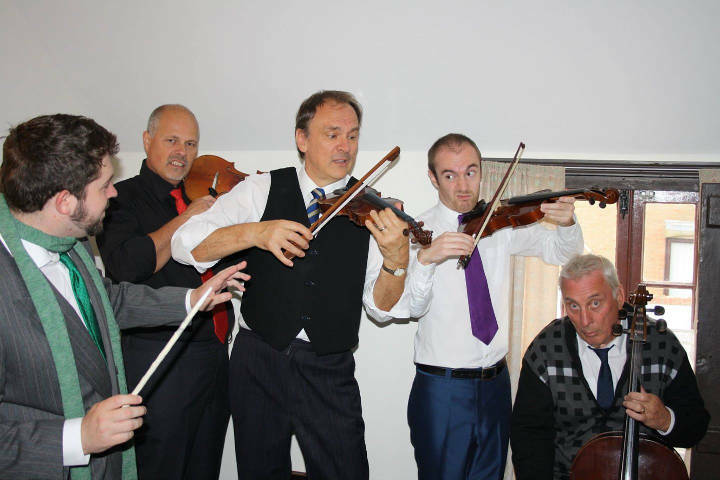 To cover for their activities they pretend to be a group of classical musicians, and play recordings during meetings to make it sound like a rehearsal. To be honest the average age of the audience was sufficiently high to make pretty sure that most of those who were there already had a good working knowledge of the piece and I will credit any readers of this review with the same insight. There is very little supporting cast but Sandra Cartwright as visiting old lady Mrs Tromleyton did a fine job and a well-judged opening and closing cameo from Rob Sweeney, as local beat policeman Constable McDonald, set things up nicely and helped in no small part to deliver the final punch line. 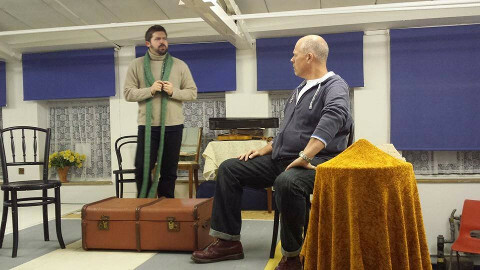 It has maybe become a bit of an am-dram cliché, but this was truly an ensemble piece, with a pretty fair distribution of lines throughout, helping the process of getting to know the characters so quickly and so intimately. The overriding comment I have to make is that the casting just seemed so perfect. Testimony to this is that as I drove home I could not imagine any of the performers I had seen, playing any other part in this play than the one they had just done … and that hardly ever happens. I had seen King’s Lynn newcomer Steve Bond over at Swaffham recently and thought he did a nice job. Well in this production he did even better, confident with his lines and kept things nicely under control never upstaging the more complex characters. I have no experience of David Coles and where he came from is a mystery to me, but I was so glad he had come. The nervous, slightly paranoiac Major was ideal for him and he delivered a quality performance. Equally so was Tony Downing as hilarious “One Round”. Perfect in every respect, but Mr Dowling .. where have you been hiding! In complete contrast, Louise Smith is a King’s Lynn legend, and as “dear old lady” Louisa Wilberforce she posted yet another legendary performance. Mrs Smith has never (to my knowledge), stepped out of her comfortable range, and she was perfectly within it on this night, doing everything right. 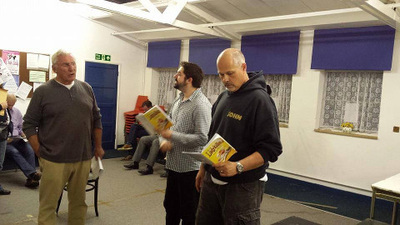 John Giller only came to my attention with the King’s Lynn Players production of Blackadder earlier this year but, as Eastern European thug Louis, he gave a characterisation that made me cry with laughter. His acting off-focus was tireless, and his facial expressions put him in a class very nearly of his own. Very nearly? Well then along came Anthony Drown as spiv Harry who just blew me away with a performance I will not forget in a hurry. To those of us who aspire to amateur dramatic greatness, you need to see a performance like Mr Drown’s once in a while to remind you never to take yourself too seriously, as there is always someone better. It is difficult to explain exactly how much top quality acting he put into this performance, but it was a joy to watch him and to learn. The more observant amongst you will notice that I have covered all the cast, leaving no one left for penultimate paragraph honours. It could easily have been John Giller or Anthony Drown but my rationale goes a bit like this. In isolation everyone in this cast was on top form, with Mr Giller and Mr Drown particularly so, and yet whatever they achieved on their own, was amplified ten times by the strength of the cast as a unit. The sum of the parts greatly exceeded the value of the parts themselves which I can only attribute to the performers and the director. My sincere congratulations to Richard Abel for assembling a stellar cast and working with them to deliver a brilliant piece of theatre. It was tidy and prompt free with my only criticism relating to the assorted deaths of the villains with a few of them not really convincing me, but, in the scheme of things it really didn’t matter. I left the hallowed Guildhall of St George with a spring in my step, exhilarated, energised and truly inspired by a presentation that will stay with me for a long time. Welcome back K.L.O.D.S, I’ve missed you!